The top ranked Cougars from Mount Mansfield faced off against the second seeded Raiders from Rutland. Last season the Raiders missed the playoffs while the Cougars lost in the semifinals so both teams had something to prove. Let’s now continue on with our coverage from Vermont’s division 1 high school football championship. When we left the Rutland Raiders held a small lead over the Cougars from Mount Mansfield. After the Mount Mansfield Cougars took down the Raiders from Rutland in Vermont’s division 1 high school football championship we spoke with a few of MMU’s players who played key roles in their teams success. 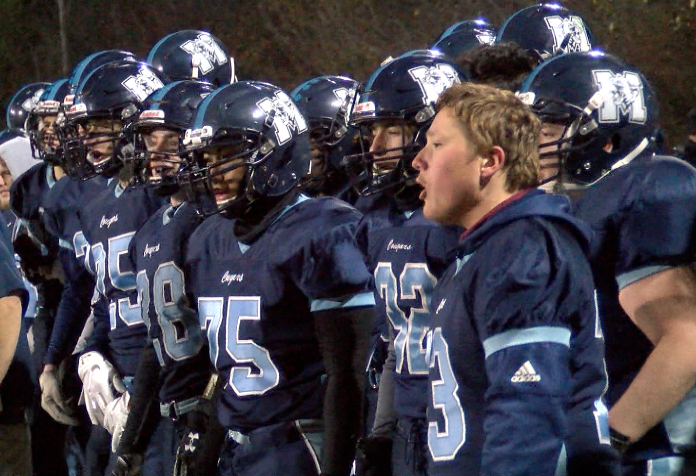 So after the Cougars from Mount Mansfield won Vermont’s division 1 high school football state championship over Rutland, we spoke with Cougars head coach Marty Richards about the game. Let’s now hear what he had to say as part of our coaches corner segment, brought to you by Bubba’s Bar & Grill.